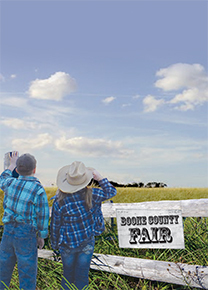 Mark your calendars, the 2018 Boone County Fair schedule is once again jam-packed full of family fun entertainment for all. This year, the fair will run July 7-11. Various events will run for the entire duration of the fair, while other events will be specific to each day. Warrior Motorsports will be on-site every day with monster truck rides. The Antique Tractor Display will take place from noon to 9 p.m. Sunday through Wednesday. Barnyard Friends Petting Zoo will be available all day, Monday through Wednesday. D.C. Lynch Carnival will start at 6 p.m. Monday through Wednesday of the fair. Bobby Cox, motorsport clown, will be present in the grandstand Monday through Wednesday. Papa Bear’s Wood Carving will also be providing entertainment on Sunday at 11:30 a.m., 3:30 p.m. and 6 p.m., as well as on Monday and Tuesday at 11:30 a.m., 3 p.m. and 6 p.m. 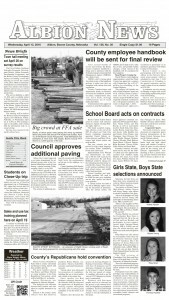 The fair will kick off Saturday, July 7, with a 7 p.m. concert featuring Chris Lane and special guest High Valley. Gates open at 4:30 p.m. Tickets are available at www.boonecountyfairne.org. The gun show will also take place earlier in the day from 9 a.m. to 5 p.m., as well as the Trucks R Fatty Truck Show and BBQ Fatty Cook-off taking place from 8 a.m. to 3 p.m.
On Sunday, July 8, the Gun Show will continue from 9 a.m. to 4 p.m. The interdenominational Church Service will also be held in the grandstand at 10 a.m. Sunday. The Down Home Horse Show kicks off 6:30 p.m. Sunday. Wildlife Encounters is happening at 3:30 p.m. and 5:30 p.m. Sunday.